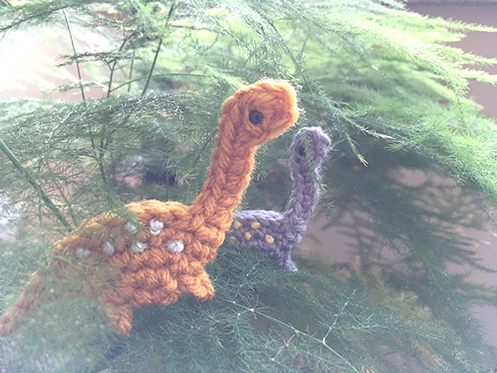 Here the Brontosaurus are enjoying a peaceful moment sharing a snack of ferns. But I picture brontosaurus living peacefully among trees, eating plants most of the time. 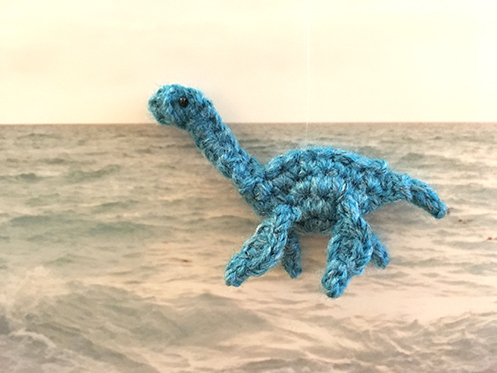 Because of the way the yarn twists in crochet stitches, the neck of the dinosaur tends to twist and not stay flat. I would suggest using a stiff‐feeling heavy worsted (like acrylic) or even bulky weight yarn to help maintain its shape. By now, you probably notice that all the mystery dino patterns follow the same dumpling base, with slight modifications for the prominent features of the different dinosaurs. 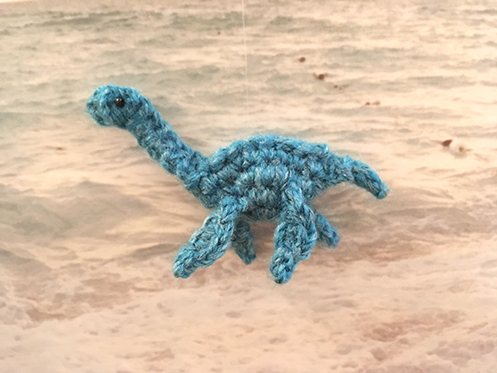 So for the brontosaurus, it is its long neck! But the body is the same as the other dinosaurs in the series. 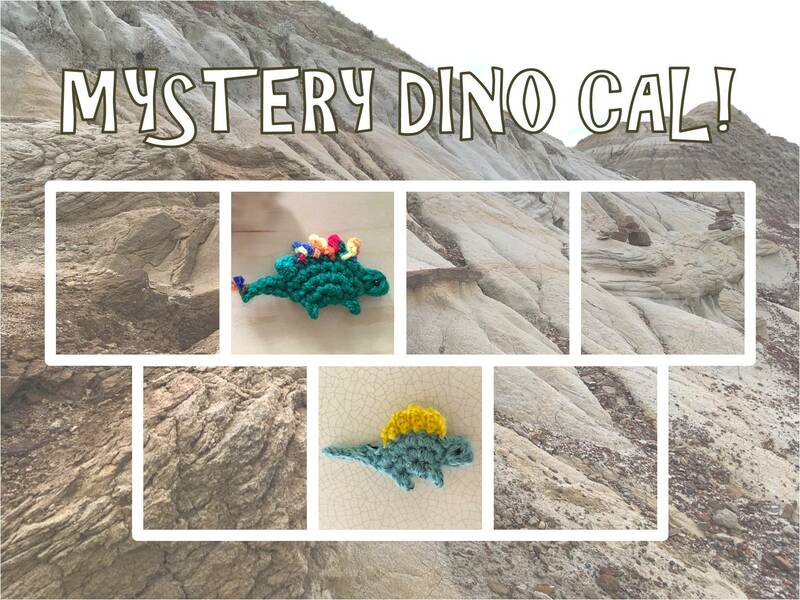 If you’re new to the CAL, visit the first dinosaur of the series, stegosaurus, for a photo tutorial of crocheting the body, tail and the legs! Tail: sl st in last st through both layers on back, ch 5, sl st in 2nd ch from hook, sl st in next ch, sc in last 2 ch of tail, sl st in a space between the 3rd and 4th round in the body (belly part of the dinosaur). Remove hook and pull out the loop. 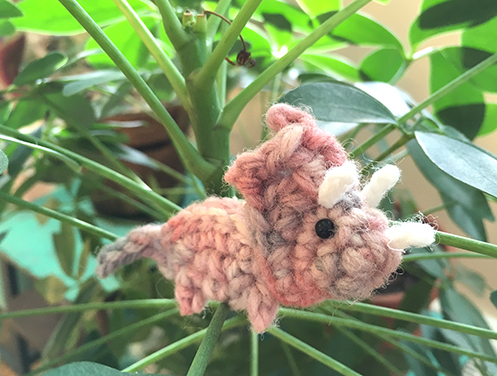 Pull through enough yarn so that you have a 12″ tail. Cut yarn. 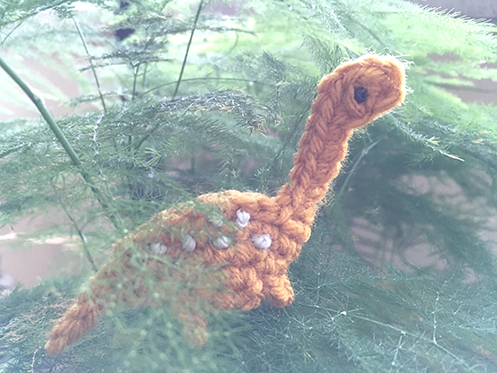 Hind leg: Thread the yarn tail through the tapestry needle, weave the needle through the belly of the dinosaur so that the needle comes out through a stitch between the 2nd and 3rd rounds of body in the front. 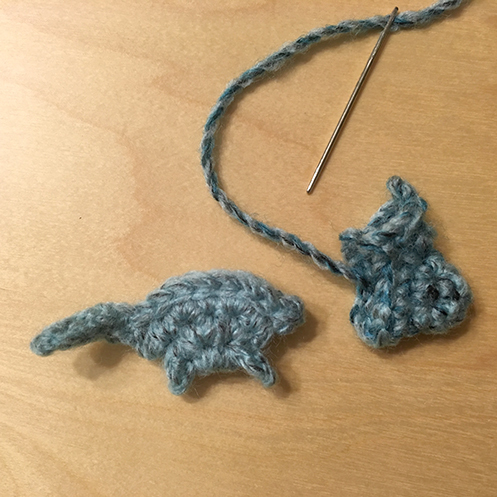 Pull the yarn tail through, remove the needle. Insert hook through the stitch where the yarn tail came through. 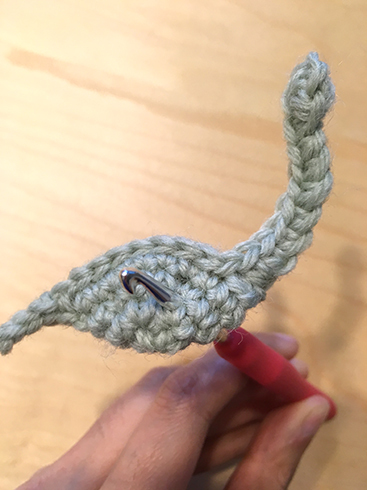 Pull up a loop using the yarn tail. ch 3, sl st in 2nd ch from hook, remove hook and pull the yarn tail out. Thread the yarn tail through the tapestry needle again, insert needle in a stitch between 1st and 2nd round in body, then come out in a stitch between 1st and 2nd round in body in the front on the opposite side. Using contrasting colour yarn and tapestry needle, make French knots on body for spots. Using black seed beads, sewing needle and thread, attach eyes. Weave in all ends. Woohoo! That wasn’t too hard, right? Bloggers: leave a comment on any of the Mystery Dino CAL posts with a link to your blog post with the picture. 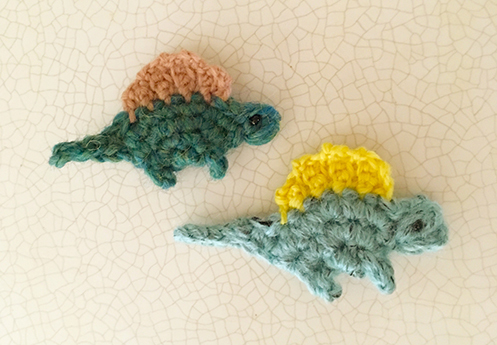 I made both versions of Trixie with a heavy worsted / bulky yarn and a 4 mm hook, because I’ve always had the idea that it’s a chunky kind of dinosaur. So the finished dinosaur is slightly larger than the other dinosaurs we have been making. 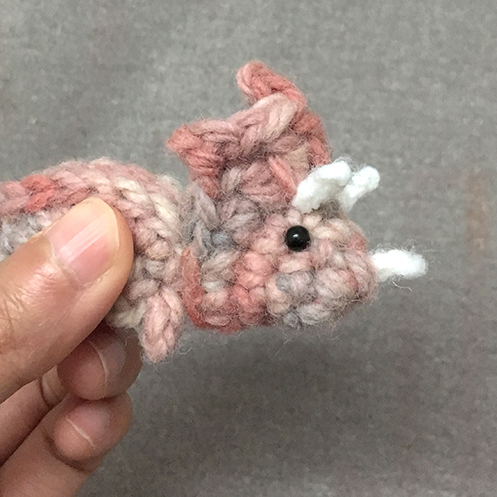 The head of a triceratops is 1/3 of its total length! So I’ve also made the body a bit smaller. The body, tail and legs of triceratops is the same as stegosaurus, except that it has one less round on the body, and skips the head. 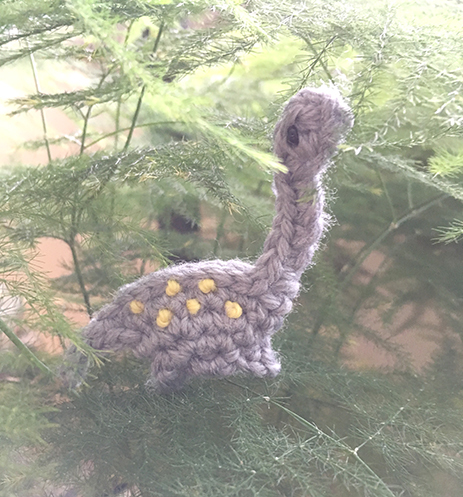 Check out the stegosaurus pattern page for photo tutorial especially on how to make the legs! But I’ll write the entire pattern below so it’s easy. The body begins as a circle, and with larger hook and main colour. Fold piece in half, sl st across back of dinosaur through both layers until last sc, don’t fasten off. Round 1: ch 2, 6 sc in 2nd ch from hook, don’t join in the round. Round 2: 1 sc in every sc around (6 sc). Round 3: [2 sc in next sc, 1 sc in next sc] three times (9 sc). Round 4: hdc in next sc, *[dc, ch 3, sl st in 2nd ch from hook, dc] in next sc*, * to * will be known as the “V‐stitch”. Repeat V‐stitch in next 2 sc, hdc in next sc, sc in next 4 sc, sl st in next st, pull out a long yarn tail for sewing, cut yarn. 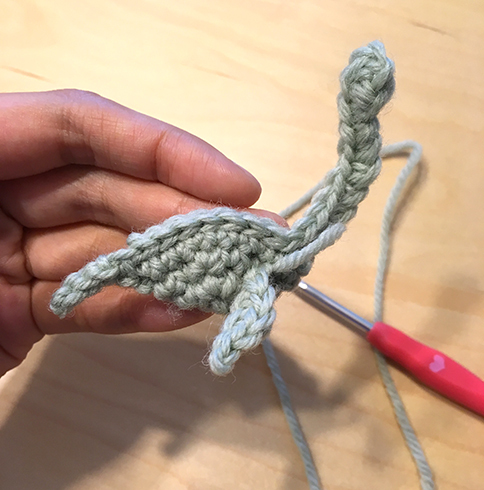 Using white yarn and smaller hook, and leaving a 3″ tail, ch 5, sl st in 2nd ch from hook, sl st in next 3 ch, ch 8, sl st in 2nd ch from hook, sl st in next 3 ch, ch 8, sl st in 2nd ch from hook, sl st in next 2 ch, fasten off, leaving a 3″ tail. You will end up with something that looks like this — 2 longer (forehead) horns separated by ch 3, and a shorter (nose) horn separated from one of the longer horns by ch 4. Remember the V‐stitch in the last round (round 4) of the head? 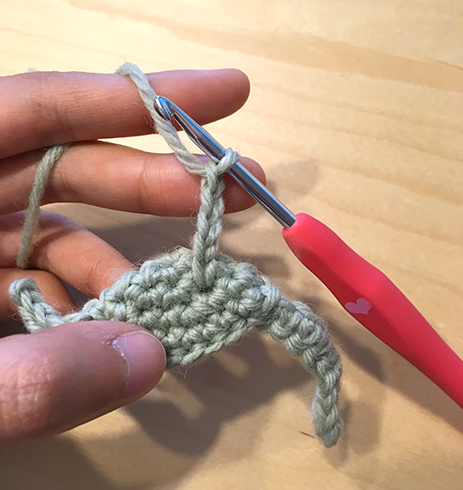 Insert smaller hook (or an even smaller hook if you have one) into the base of the first V‐stitch you made in round 4 (the V‐stitch on the most right when you’re facing it), then insert tip of the hook through a loop at the top of the forehead horn on the right. Pull the horn through the stitch in head. Then, insert hook into the base of the last V‐stitch made in round 4 (the V‐stitch on the most left when you’re facing it). Insert tip of the hook through a loop at the top of the remaining forehead horn, pull the horn through the stitch in head. 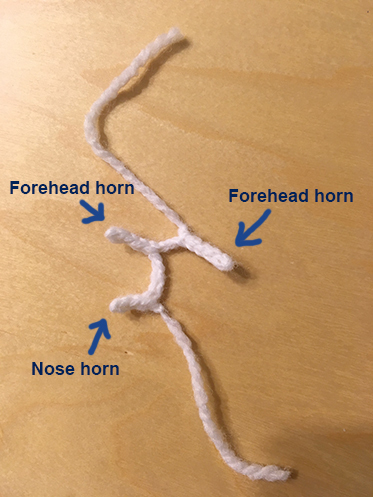 Finally, insert hook into a space between two sc’s in round 1 of head, then insert tip of the hook through a loop at the top of the nose horn, pull the horn through the stitch in head. 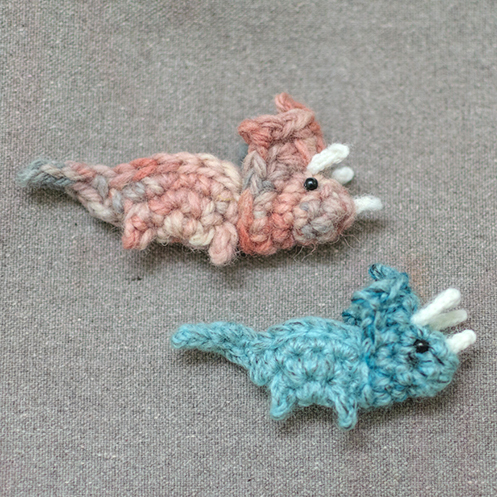 Tie the yarn tails of the horns together. You can put some fabric glue at the stitches where the horns were pulled through inside the head to secure them more, but that’s optional. Thread the tapestry needle through the yarn tail left on head. We’re attaching the base of the head to the nub on the neck end of the body. You’re folding the head piece in half, and the head will sandwich the “neck” part of the body, like so. Stitch through all layers a few times, then fasten off. The prototype for Dmitri was made while we were waiting for our flight home at Calgary airport. 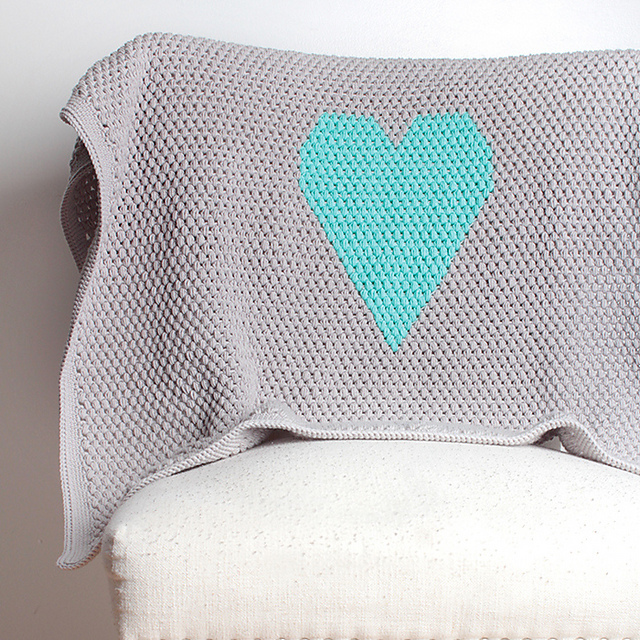 The bulky light blue yarn was all I had, but I think it turned out great! 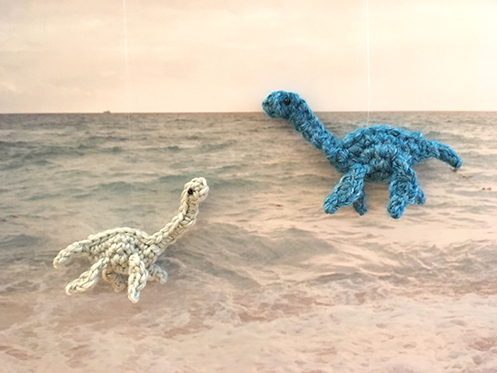 For the light blue one with chunky yarn, I used a 4mm hook for the body, and 2.5mm hook and a light worsted yarn for the sail on its back. It’s slightly bigger than the regular size one. Hook and yarn for the regular size is below. 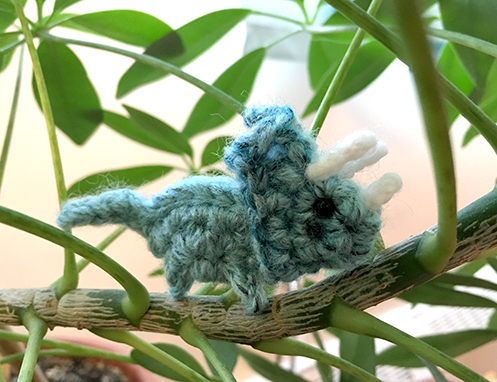 It’s the same as stegosaurus for the body, tail and legs, so if you’ve made Stu the stegosaurus, you’d have no problem making Dmitri! But I’ll repeat the entire pattern here anyway so it’s easy. You might still want to check out the link for Stu though, because it has some explanatory photos that might help clarify the steps. 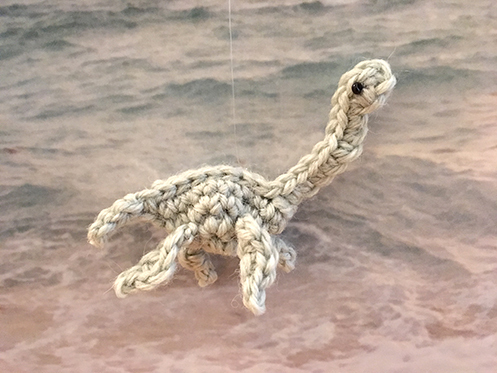 The body begins as a circle, and with larger hook and green yarn. Sail: sl st in next 2 sc, sl st in next sc and attach pink yarn when pulling up loop to finish the sl st.
Don’t fasten off green, carry it as you work across the back with pink. 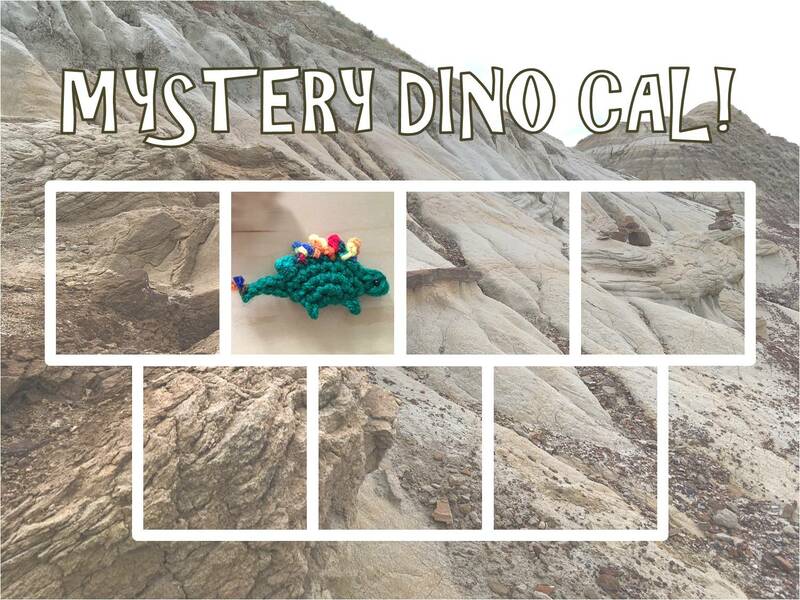 The sail is worked in rows perpendicular to the back of the dinosaur. 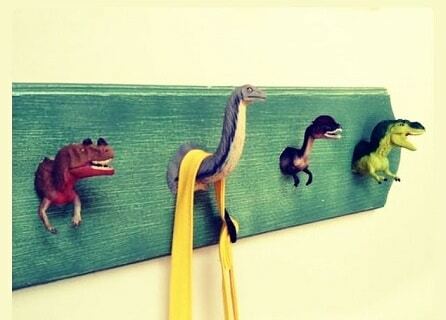 Row 1: ch 3, sc in 2nd ch from hook, sc in next ch, sl st in next sc through both layers in body/back of dinosaur, turn. Row 2: In front loops only (FLO), sc in next 2 sc, turn. Row 3: ch 2, sc in 2nd ch from hook, in back loops only (BLO), sc in next 2 sc, sl st in next sc in body, turn. Row 4: sc in next 3 sc FLO, turn. Row 5: ch 1, sc in next 3 sc BLO, sl st in next sc in body, turn. Row 6: sc in next 3 sc FLO, turn. Row 7: Skip first sc, sc in next 2 sc BLO, sl st in next sc in body, turn. Row 8: sc in next 2 sc FLO, turn. Row 9: Skip first sc, sc in next sc BLO, sl st in body by pulling up a loop using the green yarn that you’ve been carrying, fasten off pink, continue with green for tail. Tail: sl st in last st through both layers on back, ch 5, sl st in 2nd ch from hook, sl st in next ch, sc in last 2 ch of tail, sl st in a space between the 3rd and 4th round in the body (belly part of the dinosaur). 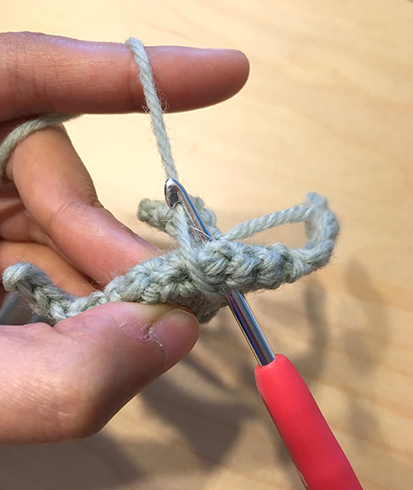 Remove hook and pull out the loop, as shown in the picture. 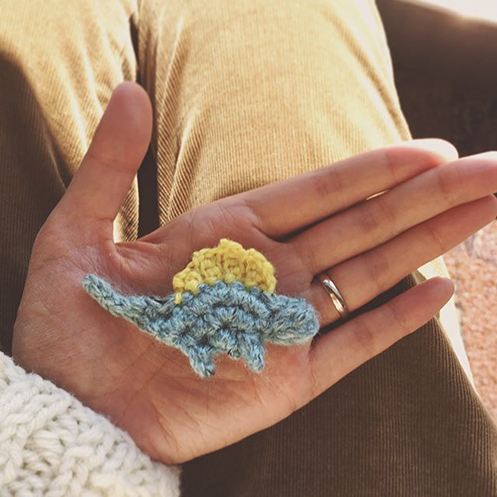 Pull through enough yarn so that you have a 12″ tail. Cut yarn. 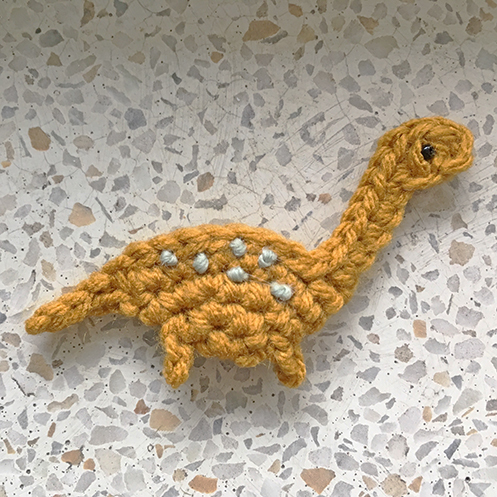 Thread the yarn tail through the tapestry needle, weave the needle through the belly of the dinosaur so that the needle comes out through the 2nd and 3rd rounds of body in the front. Pull the yarn tail through, remove the needle. 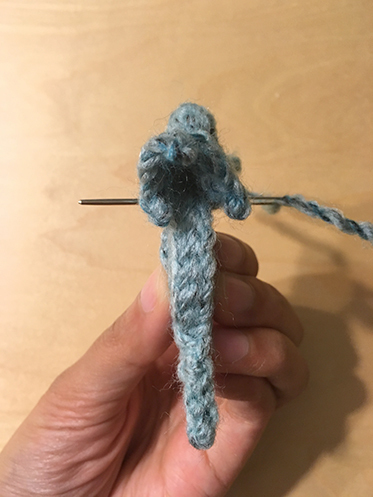 Insert smaller hook (if you have it) through the stitch where the yarn tail came through, then pull up a loop using the yarn tail. 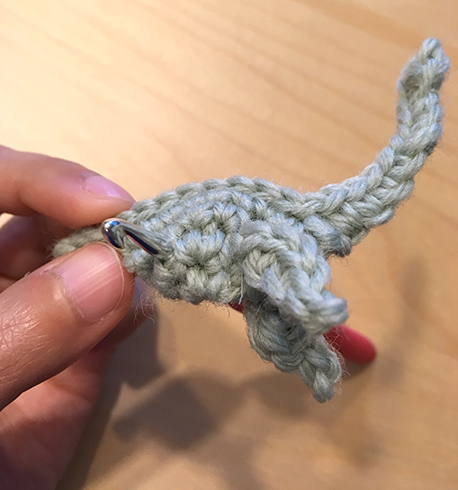 Work as the same as hind leg, as follows: remove needle, insert hook through the stitch where the yarn tail came through, pull up a loop with the yarn tail. ch 3, sl st in 2nd ch from hook, pull out yarn tail, thread yarn tail back in tapestry needle, insert needle through a stitch between 2nd and 3rd round of body, then come out near the top on the back of the piece, fasten off. Using sewing needle and black thread, sew on the seed bead as eye. 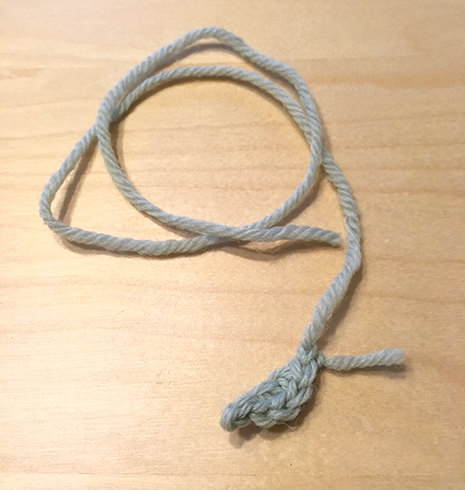 Weave in thread end. 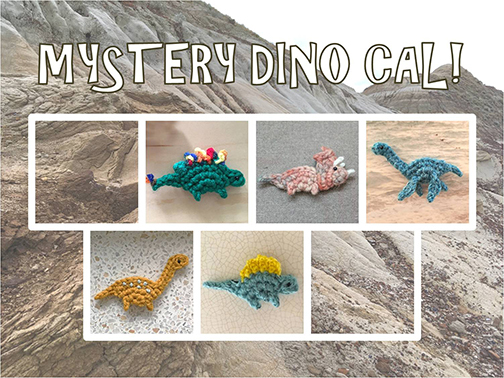 Post your FOs to my Ravelry dino project pages! If you’re just joining now, here’s the recap of what we got so far! As the saying goes… May the road rise up to meet you, and may the wind always fill your sail :) Have a terrific week! 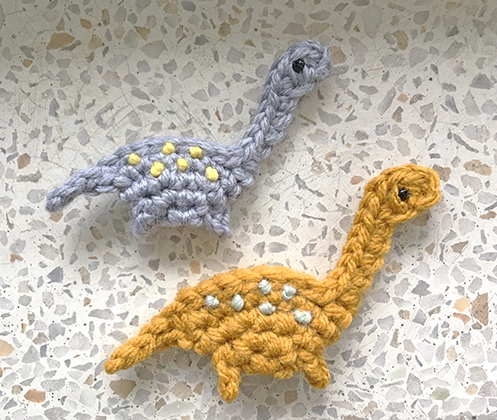 This idea has been brewing in my head for a while, to make a series of tiny dinosaurs, thinking about different dinosaur shapes and ways to articulate them with crochet stitches… and I’ve been trying to figure out the best way to organize it and invite everyone to join in on the fun. But at the same time finding myself procrastinating with the designing… So I figure, I’d just launch it! That would make sure that I do it! As you can see one dinosaur is already out! 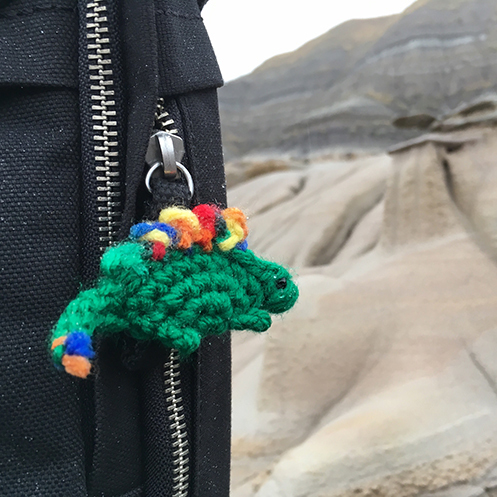 You can find the tiny stegosaurus here. I’m a big fan of Two of Wand’s simple but always interesting designs. I especially love the contrasting textures in this wrap. You can find the pattern here. Another design I really like is this cowl. It’s a simple modification of a regular cowl, but so much more cool‐looking and sculptural. You can find the paid pattern here. Cozy and bright. Paid pattern by Crochet Bit on Ravelry. 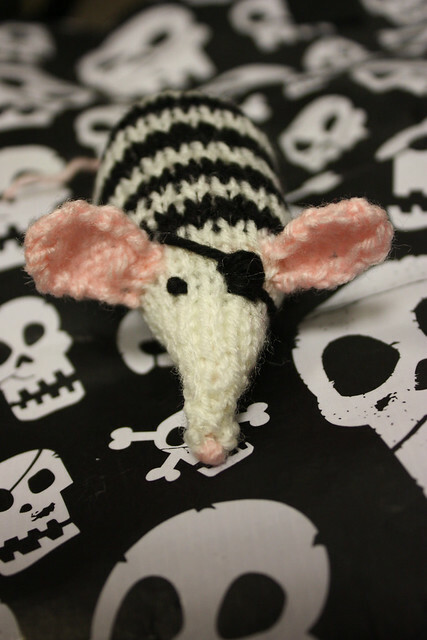 A yarrrrrn mouse! 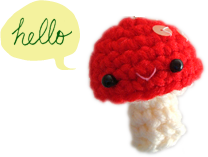 :D Pattern by Whodunnknit. 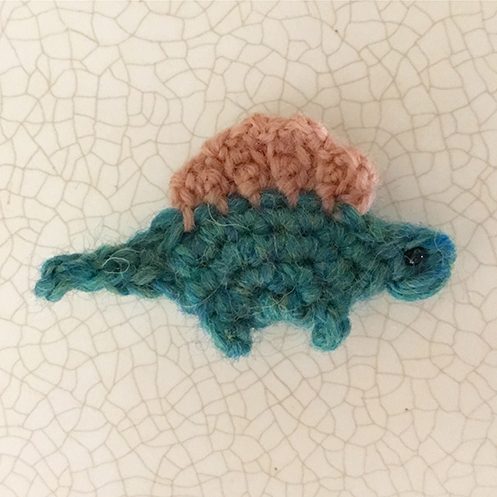 This is frankly hilarious, and reminds me of Sherman of Sherman’s Lagoon, and Liz Climo’s shark friend :D Pattern on Knitty! 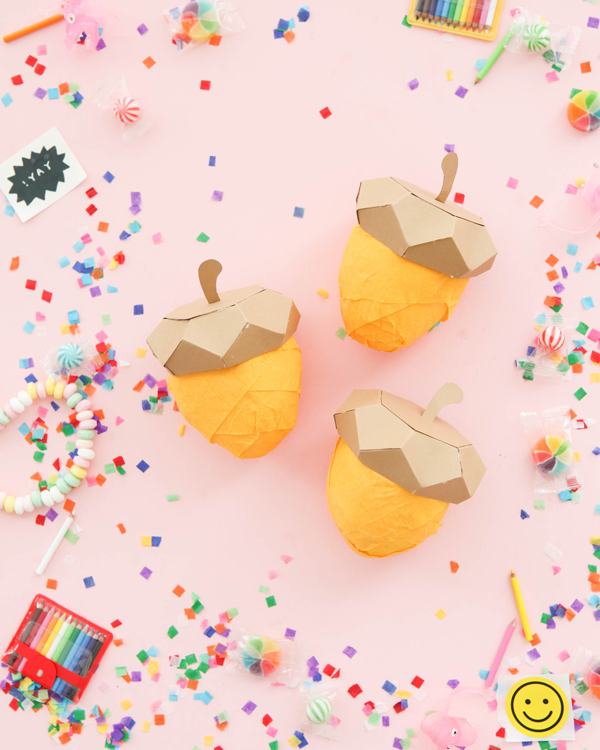 Who doesn’t love an acorn with surprises inside? :D From Oh Happy Day. 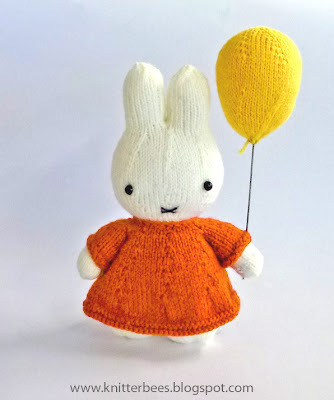 For all the Miffy fans! A free (!!) knitting pattern by Knitter Bees. Can make different interchangeable sweaters! But my skill level is probably a better match for this fox. This very cute square fox. By The Bushcrafter.